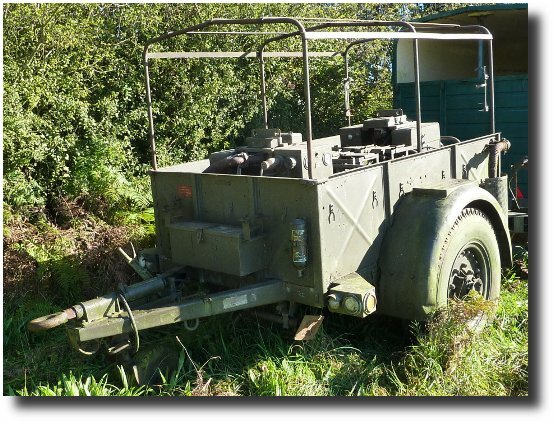 This rather original K9 Signals Truck together with trailer based Generator came up on Ebay in October 2012. The sale price was £3,200. 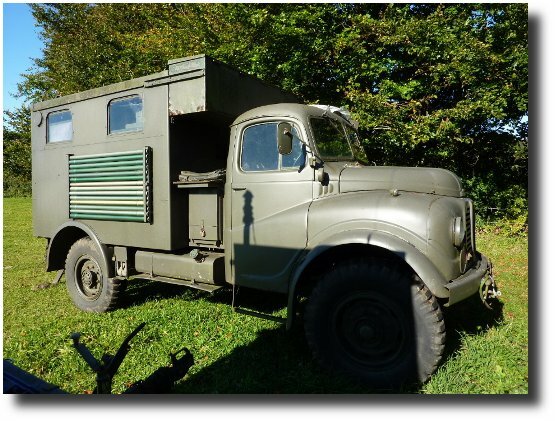 I have for sale a vintage (1956) ex Army Austin K9 Radio Truck complete with trailer generator. The truck has selectable 2 or 4 wheel drive and is powered by a 3993cc Straight Six petrol engine, which starts easily and runs and sounds really nice. 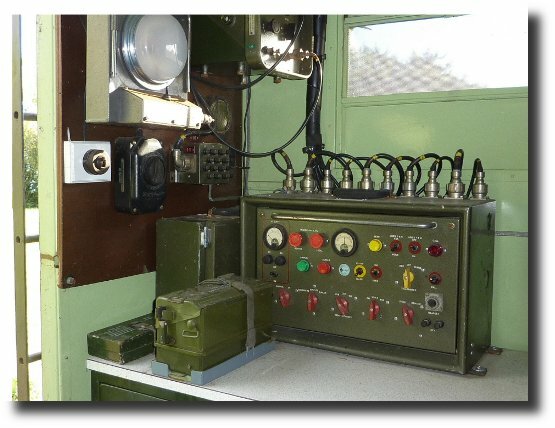 The Radio Body is equipped with its original Marconi D11 Transmitter with separate Power Supply an R230 Receiver a Siemens T100 Teleprinter and sundry ancillary items. This installation was designed to be powered from the two generators mounted in the towed trailer. Mast aerial gear and penthouse frame are stowed in the side racks and in the “coffin ” on the roof above the cab, but I’m afraid the penthouse canvas has long since rotted away. Copies of Drivers Manual, Workshop Manual and Parts Manual are included in the sale. None of the Radio equipment has been tested and the Generators have not been run for some time. 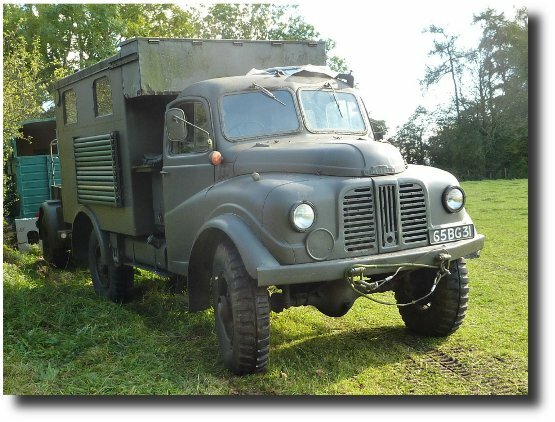 Condition is fair for a 55 year old truck and most of the original equipment is still present, however there are patches of rust in the cab which need attention and it could really do with re-painting and as mentioned the brakes need urgent attention. The truck starts easily and runs and drives, but the brakes leave a lot to be desired, they are more of a gentle slowing down device than real brakes and need attention so I would not advise driving it away. Some spares are available by separate negotiation. The K9 was first registered with the DVLA in 1996 it does not require an MOT and is currently on SORN. Insurance is cheap, I was paying about £100 a year. It is is located near Magor in South Wales (just off M4 J23A) and I would much prefer any prospective buyer to view it, and appreciate what they are taking on, before purchase. More pictures are available on request and any questions just ask and I’ll try to answer them. Payment in cash on collection is preferred but cleared cheque or Bank Transfer are also acceptable. This truck is also advertised elsewhere and could be removed at any time. Side detail shows the Dipole Support pole stowage. The Dipole wire drums will be the under slung drum as there are two, one on each side at the rear of the truck. The line above the Dipole Stowage is a canvass flap to which a ground tent is secured. This gives an expanded area in addition to the cabin space and the roof top penthouse tent. The idea was this additional space could be used as a field radio service station as well as a second sleeping area if it was too windy for the penthouse. General view of the trailer. I suspect this is the two generators who’s output is going to be 240 volts, as this there is some old MK style three pin sockets to be found inside the radio shack. The ladder on the left giving access to the roof of the vehicle would provide access to the Penthouse tent. I wonder how comfortable it was to sleep up there? The two Dipole wire drums can be seen in this view. I suspect the wooden steps are secured to the right hand panel to the right of the door. The Spare Wheel stored behind the cab. The ladder to the over cab storage doubles as a wheel ‘runway’ . The knurled knob having been undone will allow the ladder to swing out and down on the lower pivot pins, so forms a guide that the wheel can roll down so the operator doesn’t have to lift its weight. I could be wrong but I suspect under the green steel box will be a Morse Key. It could though be a telephone type handset couldn’t it. 240 volt distribution panel with the Mk square pin plugs. Clearly a versatile vehicle and lovely to see one in such original condition. 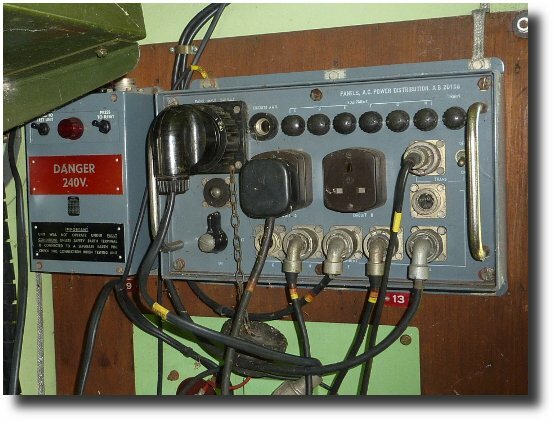 From a practical perspective for todays Radio Amateur, being original and to keep it so is to limit one self to its technology and facilities, suitable for SSB field day or the GQRP Club Valves on the air day. Insurance and Mot issues are cheap enough, leaving just the question of fuel costs. no doubt it would encourage Military Show showing. 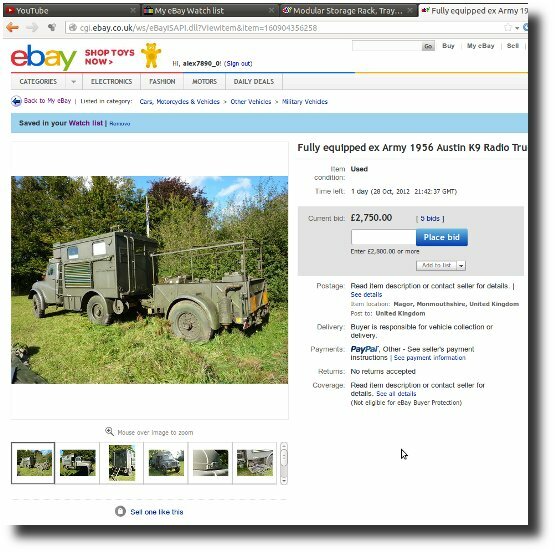 Tagged Amateur Radio, Land Rover FFR, Signals truck. Bookmark the permalink. Just for your info, the penthouse for a K9 does not actually go on the roof, but fits on the left handside of the vehicle. If you at the pic of the vehicle you have posted there is an apron(canvass) that runs along the length of the body. I’ve just sold my K9 but have a penthouse in perfect condition if you know of anyone that wants one. That is amazingly complete! I arrived at my first Royal Signals posting at the same time as the D11/R230 in 1964 – one of the only two technicians trained on it. It was quite advanced for its day, with double, single and independent side-band working as well as CW for Morse and FSK for teleprinter links. It even looked space-age: where earlier equipment was dull green or grey with black knobs, this was finished in shiny hammer-finish green with black, red and yellow knobs according to function. The R230 receiver (later R234) is on the left and the D11 transmitter on the right. The big box in between is the PSU; above that is the aerial tuning unit, and above that the aerial coupling with an SWR meter on the front. I don’t recall the box at top left, but I think it may have been a separate ATU for the receiver. The Siemens T100 teleprinter on the right came with paper tape reader and punch, and was a godsend after the incredibly noisy Creed 7B. The operator’s desk and console are on the left – note the folding operator’s chair inside the door. The box strapped down on the desk is, indeed, a field telephone. 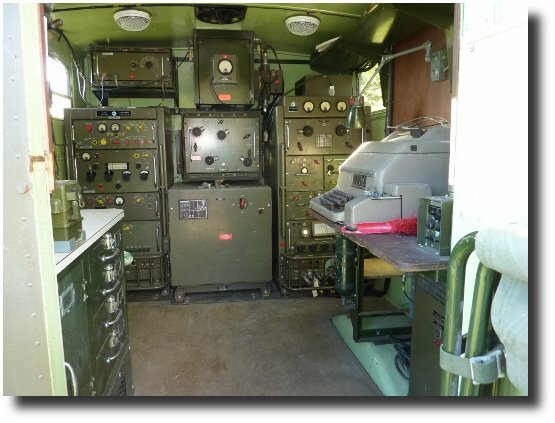 The Morse key, operator’s headset and handset will have been stored in the drawers under the desk along with message pads, pencils and the like, spare rolls and paper tape for the teleprinter and such essentials as tea and coffee. At night the roof lights would be off and the blackout shutters up, with the dim light on the wall above the console the only illumination. There was room on the floor in front of the equipment for one person – usually the crew chief! – to lay out a bedroll and enjoy a warm, dry night’s sleep. The rest of us slept outside, under the stars or in two-man bivvies. As Paul has pointed out, the penthouse, stored in the coffin, would be erected against the left-hand side of the vehicle but we rarely bothered with it. Dismantling and stowing it in a hurry, especially in the wet and the dark, was a rectal discomfort. The right-hand cable drum carried the power cable, which would be pulled out to connect the vehicle to one of the generators. The left-hand drum was for D10 telephone cable (tough stuff) which would be laid to a field telephone in a command post or comcen. Our end would connect to the telephone on the operator’s table. There was also a screw terminal for connecting the chassis to a big, steel earth pin, driven into the ground with a sledge hammer. I don’t recognise the generators in the trailer. Ours were much taller – twin 3.5KVA 240V single phase AC generators with big radiators. I remember the radiators particularly because we used to stand a jerry can of water in front of the radiator over night so that we had warm water for a wash and shave in the morning. Aerial cable and the erector gear, collars, halyards and ground anchors for the aerial masts were all stored in the coffin with the penthouse, and like the penthouse we did our best to avoid using them. With a sensitive receiver and a 300W transmitter we didn’t really need to, and the most common arrangement was a single whip aerial or a twin-vee mounted directly on the roof. We were frequently told that it was tactically desirable use a more directional aerial and radiate less power, and I’m sure it was, but it was also tactically necessary to be able to move at the drop of a hat, and that wasn’t going happen if we had to take down 40-ft masts section by section, coil the halyards, dig out the ground anchors and stow it all away. Especially in the dark. The receiver was a great toy. When not on net we sometimes amused ourselves by getting soviet propaganda from TASS on the teleprinter or, even better, the Albanian equivalent which alternated between the wonderful doings of Comrade Hoxha and invective hurled, in more or less equal measure, at Capitalist Running Dogs (us) and Soviet Revisionists (the Russians). Another pastime was working out the characters needed to punch a paper tape so that, held up to the light, it would read “I LOVE YOU”, or something more basic. There was also an underground market in tapes that would print typed pictures of naked ladies to go on the wall. 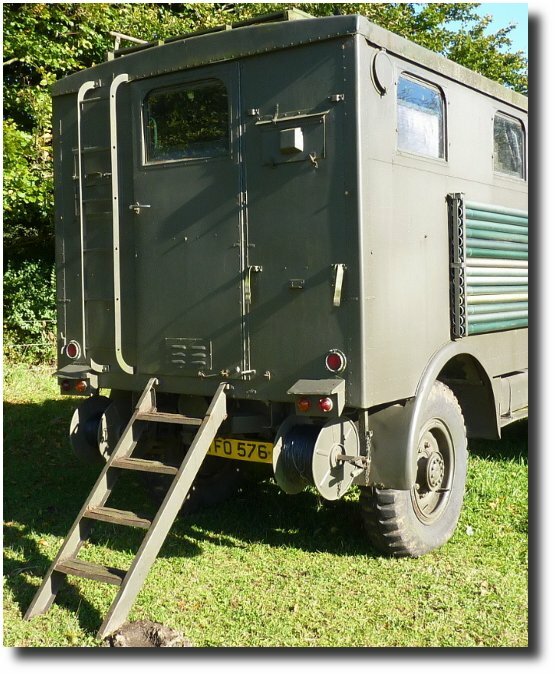 Just to add to Paul’s comments, the ladder at the rear is to gain access to rooftop duckboards which allowed you to get at the ‘coffin’ storage on the front of the body and the roof aerial mounts. 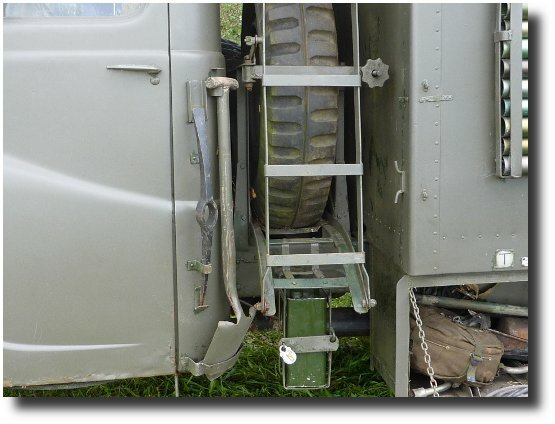 The ladder on the spare wheel rack is just a ramp to get the spare wheel down; it’d be very difficult to access the coffin from it as you’d be partly underneath the coffin. The box on the side under the body is a battery box. 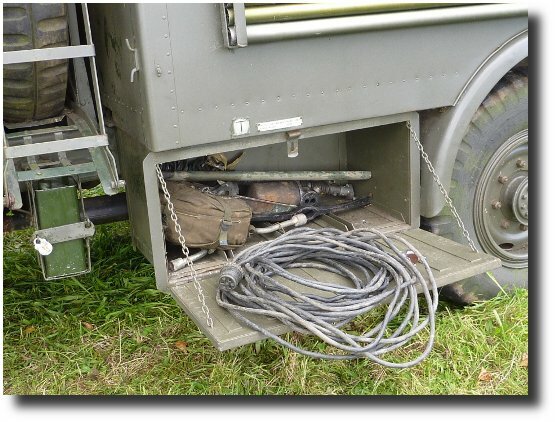 Some K9s had a generator mounted on the chassis and driven by V belts from the transfer box. The trailer is a Brockhouse or similar one ton trailer probably with two Onan 240V generators in, and is probably not original to the vehicle. What a fantastic vehicle with all the kit in. when we were backloading them from 22 sigs in 1972 we had to make up the full CES first so the vehicle went back for sale/disposal with every item intact. what a bind trying to find the pins which were used to mount the penthouse and as for padlocks i think it had about 20 in total. I wrote my K9 off a few weeks before I left the army. brakes failed and ran it into the back of a new 3 tonner with 1 ton mounted radio box on back. hey ho. happy days. I was posted into 22 Sigs in 1973, and we still had the K9 vehicles, which were soon replaced with the Bedford RL larger box Dll/R234 installation. notice how narrow the tyres are on the K9, and as the vehicle was very heavy for its size it easily got bogged down. 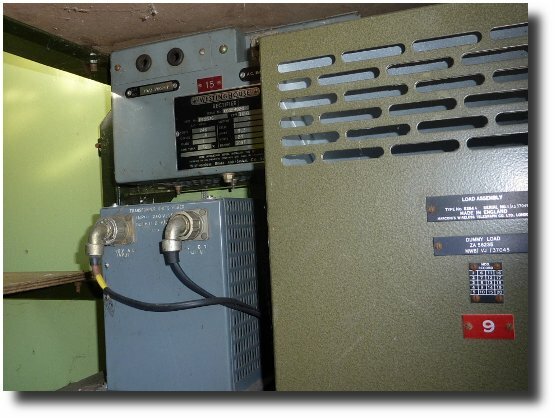 posted from 22 to 604 Signal troop in 1977, and we had the K9 box mounted on a RL vehicle, and the generators were vehicle mounted, as the role called for mobile D11 working, via a common antenna twin v from the transmitter pot. this meant we had to tow an empty trailer, so the twin vee could face backwards, and stop the following vehicle from running into the whip antenna. the empty trailer made a perfect sleeping place, everybody had an old mattress fitted, then your sleeping bag and pillow. 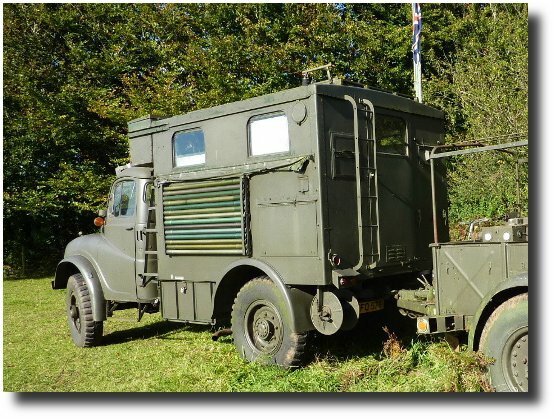 it was a sad day when we were reequipped with Clansman, Landrover mounted, and we went back to the 2 man bivvie. loved compo, ! still remember menu E, my favourite, steak and kidney pud, garden peas, fruit salad, oatmeal blocks with a cup of tea, terrific grub ! !